" St. Edmund held HINDERCLAY before 1066 as a manor; ..
.. A church with 1 acre of free land in alms. .."
The present building is of Norman origin, dating from 1128. 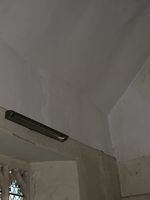 Many alterations took place during the following two centuries. The first recorded Rector was Rogerus de Caley who came to the village in 1286. You will find a list of all the Rectors who followed him on the RECTORS' page. The population of Hinderclay had increased during the 13th Century. Between 1257 and 1260 the 10 men of Hinderclay were succeeded by 17 sons! Then, for some unknown reason, the population began to fall, so by 1341 there was a lot of untilled land recorded. With the Black Death arriving in Britain in 1348 the situation worsened. We know that the lordship and demesne village was in the hands of the Abbot of Bury St. Edmunds by gift of Earl Ulfketch. (Demesne: Under the feudal system in the Middle Ages this was land kept in the lord’s possession and not leased out. It was then worked by villeins (peasants) to supply the lord’s household). When Henry VIII dissolved the monasteries (1536-39) it was granted to Thomas and James Bacon. For ecclesiastical purposes England had been divided into two provinces by the 1300s - the senior was Canterbury and the other York. Hinderclay was in the Archdiocese of Canterbury and the Diocese of Norwich, which included the Counties of Norfolk, Suffolk and parts of Cambridgeshire. Until 1837 Hinderclay was also part of the Archdeaconry of Sudbury and in the Deanery of Blackbourn. During medieval times prayers were regularly said for the souls of the dead. The rich ensured this by setting up charitable foundations, so that priests (called chantry priests) would say masses for their souls in perpetuity. The poor could not afford this so they often joined a guild, where, for about a penny a week, they could ensure that the guild chantry priest would say masses for their souls after their deaths. Guilds often centred around particular occupations, and became a focus of social activity, meeting in guildhalls. Hinderclay church had at least one medieval guild - the Guild of St. Peter, which was still in existence in 1505. The Registers of Baptisms, Marriages and Burials date from 1567, although all but the current ones are now kept at the Suffolk Records Office in Bury St. Edmunds. The Patronage (the right to be consulted in the choice of a new Rector) of the living remains in the Holt-Wilson family. They are descendants of Sir John Holt, Lord Chief Justice of the Court of King's Bench, who purchased the Manor of Hinderclay in 1685. In 1837 the Diocese of Norwich was reorganised and Hinderclay was moved from the Archdeaconry of Sudbury into the Archdeaconry of Suffolk, still remaining in the Blackbourn Deanery. The six bells were not rung from 1893 for eleven years due to problems with the tower subsiding. The Rev. W. W. Hawkins thoroughly restored the framework but the final restoration was left to the Rev. E. Farrer and was completed in 1904 (see below). St. Mary's church was thatched until 1842 when the roof was replaced with blue slate. 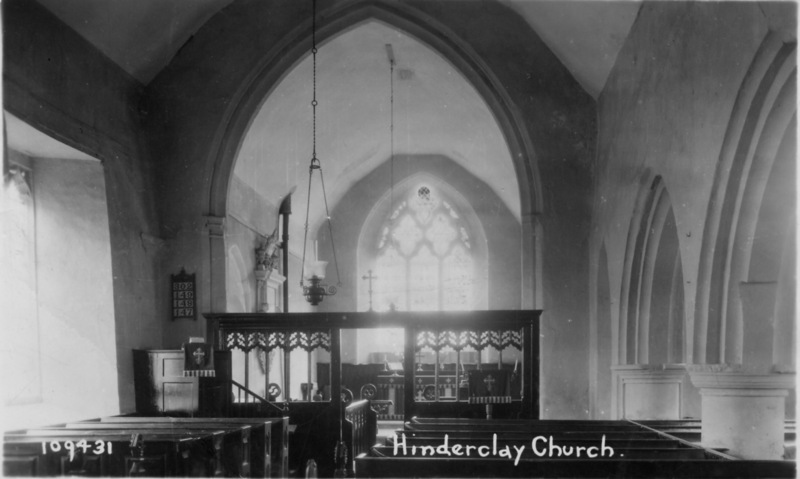 "Hinderclay Church about AD 1800 Presented by the Rev Canon Sawbridge BD, Rector of Thelnetham to the Rector and Churchwardens of the Parish of Hinderclay Church, 1915." A school for poor children was supported by the Rector (Rev Thomas Wilson) and was in existence in 1844. It subsequently became a National School for about 50 pupils. A schoolteacher's house was built in 1872 for £500. The school, which is next to the church, closed in 1953 due to the small number of children living in Hinderclay. It is now a private dwelling house. The 1851 Census of Religious Worship reports that there were 100 free sittings and 80 others. The latter presumably referred to the box pews. It also reported that the church only had Holy Communion celebrated 4 times a year - this was due the disrepair into which the church had fallen. 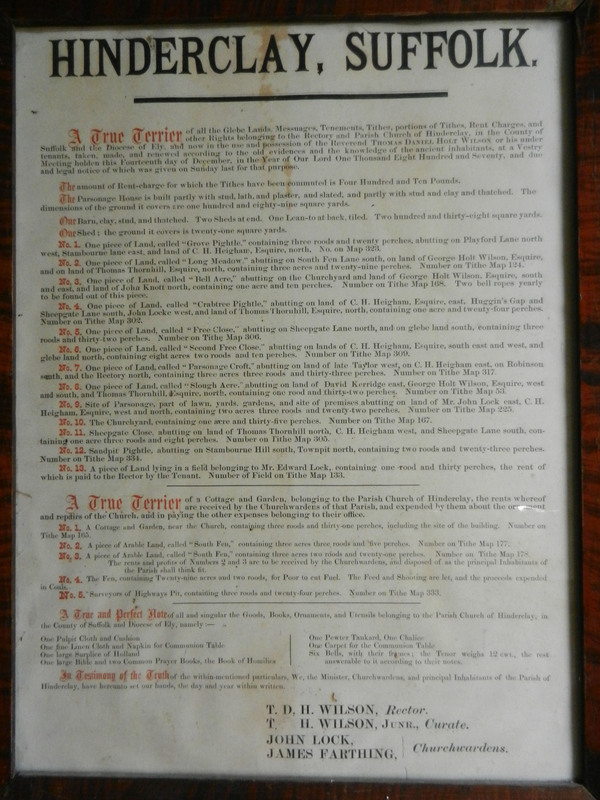 In the Vestry is a framed 'True Terrier' (inventory) dated 1870. It lists the land, buildings, rents, tithes and property belonging to the church and the parish of Hinderclay. The fen's 29 acres were for the 'poor to cut fuel' and the proceeds of the 'feed and shooting' on it were to be spent on coals. Virtually all of the church's items have apparently been sold-off over the years. Many documents refer to church repairs (White and Kelly's Directories of Suffolk in particular). In 1897 the Rev Edmund Farrer was so desperate to get the church repaired that he had a circular printed and sent it to anyone he thought might make a donation. On the reverse of this document the Rev Farrer described how in 1893 cracks had appeared in the tower and that it was now subsiding. Pieces of masonry had actually fallen from the tower. The cost of repairs would be £200 and the only alteration to the tower would be the blocking up of the tower door, in the south face, which had only been there for about 100 years. We are not sure when this photograph was taken. It could be any time between 1884 (When George Eastman invented the modern 'Kodak' camera) and the 1960s! It is interesting to see the Stove's chimney rising through the roof in the chancel. We know from the 'Vestry Minutes' (21st October 1869) that a Mr. Wilkinson gave a stove to the church. The meeting also agreed to fund coals from the parish land and insure the church with Norwich Union for £800! Notice the oil lamps, the cloth along the wall behind the table and the space where the organ now stands. It is thought that the roof of the church was raised during Victorian times. 'The Suffolk Chronicle and Mercury' dated 15th February, 1935 reported that in 1871 the church was thoroughly repaired and that 10 years later the building underwent extreme restoration. If you look above the north aisle windows a sill can be seen where it is thought the original roof was. 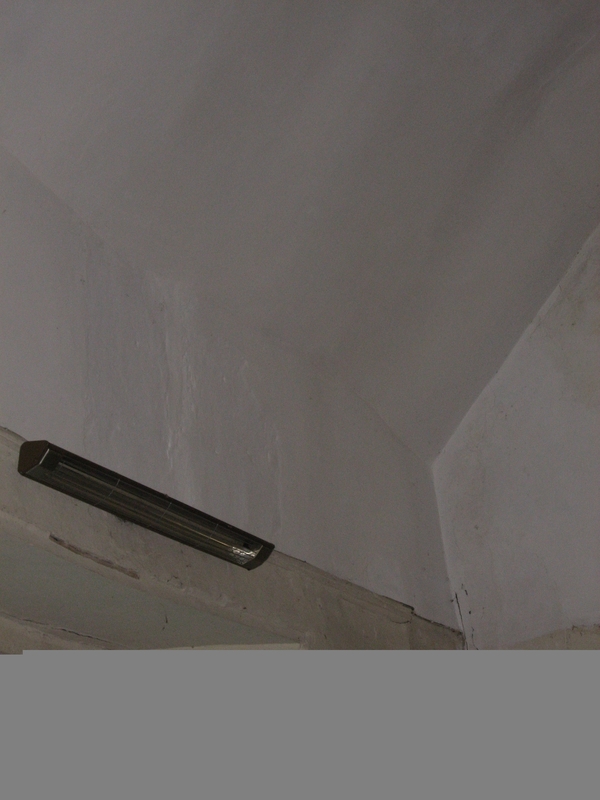 On the right of this photograph you can see part of the sill (plus some electrical wires) where it is thought the original roof was. In 1914 the Archdeaconry of Suffolk became part of the newly created Diocese of St. Edmundsbury and Ipswich. 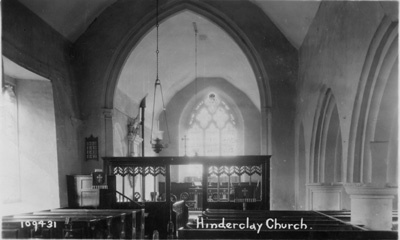 In 1972 Hinderclay was moved back into the Archdeaconry of Sudbury and into the Deanery of Ixworth. The soil of Hinderclay, as the name suggests, is heavy clay. There was no proper drainage in the church until 1962 and even now the church cemetery often becomes water-logged during winter. Flooding of the church was a great problem in the early days and the fact that the arches inside are abnormally low - as are the side windows - led the Bury Free Press to report (18th August 1962) that at some time in history the floor had been raised by about 3 feet to prevent flooding. Their information probably come from the Rev. Dr. Welton but we do not know what evidence he had for that. It could just have been the architect's design at the time of building. The pillars are Norman and are thought to date from about 1225. St. Mary's Well is situated some way along the road towards Thelnetham. 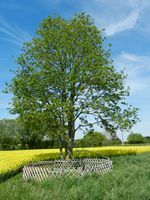 The spring is in a field, near the foot of a healthy looking elder tree. Many people pass it by every day oblivious to its history. In the past the spring was thought to possess medicinal properties and could cure eye ailments. It was therefore sometimes visited as a place of pilgrimage. The history of our church is inextricably entwined with the building itself and more interesting information can be found on the BUILDING pages.